Tagerator is a simple program designed to help you understand how you are using tags on your Flickr photos. It will scan your entire photostream, and then show you how many times you have used each tag. 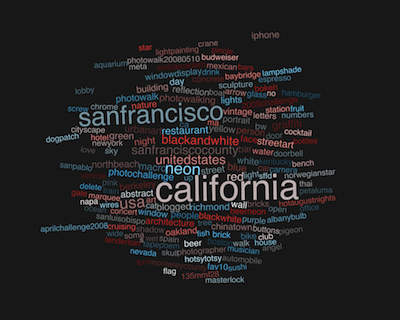 Tagerator will also generate tag clouds from the data. Tagerator is a great compliment to SuprSetr, making it easy to figure out what tags you may want to use to create new sets. 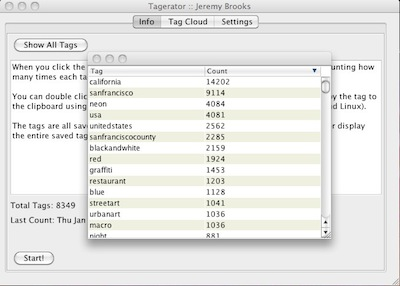 Tagerator is written in Java, and will run on any operating system that has Java 1.6 or higher installed, including Mac OS X, Windows, and Linux. Something not working? Found a bug? Contact me via the Tagerator app page on Flickr. Tagerator is copyright 2011 by Jeremy Brooks, and is licensed under the GNU GPL version 3.